Faceplates will be used to complete the front of a fireplace and will provide the frame for doors to attach. Refractory panels insulate the firebox for a proper burn, as well as providing a more authentic masonry look. A forced air kit can be used to move air to other parts of the home or to supply surplus heat to an HVAC system. With a SuperPro All-Fuel Fireplace Adaptor Plate you can connect SuperPro chimney pipe to most factory-built fireplaces. Adaptor comes with a stainless steel collar. You can't go wrong with a SuperPro All-Fuel Insulated Stainless Steel Chimney Pipe. Two stainless steel walls and a layer of mineral wool insulation ensure a proper flue draft and keep the exterior of the pipe relatively cool. That means that any wood, oil, coal, or gas appliance vented with SuperPro pipe is guaranteed to be as safe and efficient as possible.SuperPro's All-Fuel Insulated Stainless Steel Chimney Pipes are also easy to work with. For example, because these pipes are relatively narrow with and require only two inches of clearance, your placement options are virtually unlimited. And once you're ready for installation, twist-lock connections effortlessly join these chimney pipes to any of the many accessories included in this versatile line.A perfect combination of reliability and convenience, this SuperPro All-Fuel Insulated Stainless Steel Chimney Pipe makes it easy to create a UL Listed chimney system for any heating appliance. This package of two SuperPro elbows can be used to create chimney offsets during chimney installation. The elbows are part of the double walled SuperPro system that can be used to vent wood, oil, coal, and gas appliances. The double walls are of stainless steel and they encase a 1" layer of insulating mineral wool, which is a design that permits a 2" clearance to combustibles. The pieces have embossed couplers for enhance moisture resistance and use twist-lock connections. The pieces have an 8" inner diameter with a 10" outer diameter. The kit comes with two elbows, four locking bands, one elbow support bracket, and necessary fasteners. A limited lifetime warranty applies. This part is UL listed. This all fuel Glavalume Finishing Plate by SuperPro, provides a more refined, finished look for your chimney pipe installations. This stove pipe finishing plate is for use with 8 in. SuperPro chimney pipes and maintains a 2 in. clearance to all fuel combustibles. All Selkirk SuperPro line of chimney ventilation products are UL Listed and test to UL 103. This finishing plate is made with the high quality, durable glavalume steel construction and comes with a limited lifetime warranty. Passing a SuperPro All-Fuel Chimney through an attic? Then you need a Galvalume Attic Insulation Shield. This venting accessory ensures any home's safety by preventing debris and insulation from accumulating next to chimney pipes. Some SuperPro chimney installations require you to pass pipe through a second floor. On those occasions you must use a Firestop Radiation Shield to prevent insulation from accumulating near the chimney. Required when chimneys are enclosed directly below the roofline, this SuperPro All-Fuel Chimney Pipe Rafter Shield protects rafters from the heat generated by chimney pipes. Provide crucial support and stabilization for any SuperPro installation with this SuperPro All-Fuel Chimney Pipe Wall Support Band. Joint Locking Bands should be used on elbow joints, lengths between elbows, and connections to a tee to provide perfect security for the SuperPro All-Fuel chimney pipe system. The stainless steel resists corrosion so you won't have worries about the part rusting. The joint locking band will fit 8" SuperPro chimney components. Be sure that any chimney installation is designed for your particular situation and that all components are installed according to applicable safety codes and regulations. Passing SuperPro chimney pipe through a floor, ceiling, or roof? Use this SuperPro All-Fuel Chimney Roof Support to provide the structural support and stability you need. Constructed with durable galvanized steel, this roof support can hold up to 50' of chimney. If your SuperPro All-Fuel Insulated Stainless Steel Chimney is going to extend more than five feet from your roof, then you should consider investing in a SuperPro All-Fuel Chimney Roof Kit. Complete with two 5 foot galvalume legs and an adjustable locking band, this SuperPro roof kit will provide your chimney pipe with the support it needs to keep it secure and stable during those windy and rainy nights. Fits five-inch to eight-inch diameter chimney pipes. Every component in the process of installing a chimney is important. SuperPro has specifically designed their All-Fuel Low-Pitch Roof Flashing and Storm Collar to make sure that all Chimney Pipes with an 8-Inch Inner Diameter will be securely installed to the roof of your home. After all, the last thing that you want is to pick up a leak in your roof due to using materials that aren't up to snuff. So pick up the SuperPro All fuel low pitch roof flashing and storm collar today and secure not only your roof but your peace of mind as well. Every venting project offers unique challenges and requirements. This roof flashing comes with a storm collar is intended for use 8" SuperPro chimney pipes. If you need to vent your chimney pipe through a steep pitch roof between 6/12 and 12/12, then this durable accessory will be just what you need. SuperPro has designed this product for durability and it is manufactured with galvalume construction. As a guarantee that this accessory will continue to meet your venting needs for years to come, SuperPro offers a limited lifetime warranty. Complete with rubber boot, spacer kit, and mounting screws, this Selkirk All-Fuel Chimney Universal Rubber Boot Flashing Kit provides you with a convenient way to provide UL Listed flashing for metal roofs. Fits most chimneys with a 5" to 8" diameter. SuperPro is one of the most durable factory-built chimney systems available, but without adequate weather protection even a SuperPro chimney will deteriorate over time. That's why you should always cover your chimney terminations with a SuperPro All-Fuel Deluxe Chimney Rain Cap. Made of durable stainless steel, this chimney cap provides an excellent defense against rain, snow, and wind. This Osburn EPA Certified Horizon Wood Fireplace is capable of producing 95,000 BTU per hour while using seasoned cord wood and is made with the materials that will keep you assured of your fireplace quality. Durable C-Cast baffles help complete this capable unit, which is provided with a confidence boosting lifetime warranty. The innovative design includes a self cleaning ceramic glass system, one of multiple features that are sure to impress and motivate your purchase. Can this be put in a false wall? I don't have a pre-existing fireplace. Yes, this is a built-in stove type woodburning fireplace that can be framed in a new enclosure with no existing fireplace/chimney in place. Can this be fitted with gas log lighter? 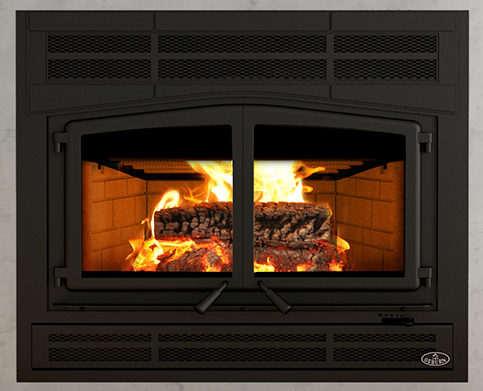 No, as with most closed-combustion, efficient woodburning fireplaces like this Horizon model, a gas line cannot be installed in it. Is it a zero clearance fireplace? This is indeed a zero clearance fireplace. Is this fireplace an EPA certified phase II conforming unit? I checked the EPA's list, but suspect the popular names are not listed by the EPA. Thank you. Per the manual for this model, it is an EPA Phase II certified appliance.